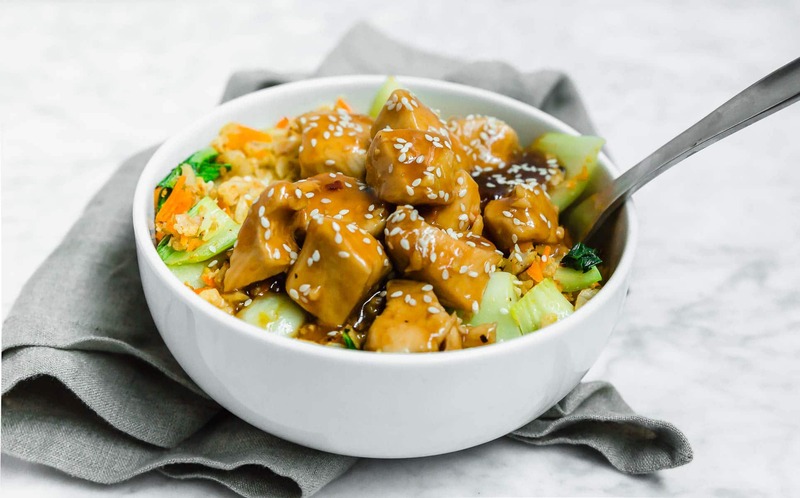 These paleo chicken teriyaki cauliflower rice bowls are full of flavor, you’ll love having this recipe in your pocket for a quick and easy lunch or healthy meal prep. Instead of rice, we’re using cauliflower “rice” as the base of this bowl. Mixed with carrots and bok choy, this recipes is loaded with veggie power! Looking for healthy meal prep ideas? You’ve come to the right place. You know me, I’m all about the meal prep ideas, especially during the summer. The summer is always super busy and full of activities. I find if I don’t meal prep then I don’t eat as well as I’d like to. I grab foods that aren’t as filling which leads to lots and lots of snacking. So meal prep is my friend. And it should be yours, too! These paleo chicken teriyaki cauliflower rice bowls with bok choy and carrots are the perfect meal prep recipe! Now… I know I’ve said a lot of scary words just now. Paleo. Cauliflower. Bok Choy. I know, I know. But hear me out. As you know, everything on this website is gluten-free and much of it is dairy-free, which often times lends itself to paleo eating. Yes, I do eat grains, such as quinoa and rice. No, I am not strictly paleo. But I know some of you are! So I thought I thought I’d make a very basic changes to my favorite chicken teriyaki recipe to make this recipes paleo for you all! First, I swapped out white rice for cauliflower rice. If you’ve never had cauliflower rice, it’s really just cauliflower pulsed in a food processor until it resembles rice. Don’t be fooled – it doesn’t taste like rice. But, when cooked with a little oil in a skillet until crispy, it’s a pretty delicious substitute! Since this recipe is paleo, I also used coconut aminos instead of my typical gluten-free tamari. What are coconut aminos? Coconut aminos are made from the “sap” of coconut flower blossoms. It’s a great substitute for soy sauce or gluten-free tamari sauce without the soy! However, coconut aminos are not as salty as tamari or soy sauce and has a slightly sweet taste. For that reason, I don’t think as much sweetener is needed in the teriyaki sauce. Speaking of sweeteners, we’re using either raw honey or pure maple syrup here (I’ve tested with both!) which are both paleo approved in moderation. If you aren’t paleo, feel free to use brown sugar. To thicken the sauce, use tapioca starch (it’s made from yucca), which you can normally find in the gluten-free aisle of your grocery store. Again, if you’re not paleo – feel free to use cornstarch! So many variations with this recipe! Hooray for bok choy! Have you ever cooked with bok choy? If not, you’re in for a treat. It’s so good in this teriyaki bowl! I used a regular sized boy choy in this recipe, but you can also use several baby sized bok choy (probably about 8 of them) in the recipe, too! I’ll go over how to prepare and cut each. To prepare the regular sized bok choy, I like to trim off the bottom of the bok choy, about 1-inch. Then, take the leaves apart and thoroughly wash the bok choy, removing any dirt. Cut the stems/leaves in 1-inch pieces. The leafy green portion will wilt down quickly in the skillet. The stem is a little more fibrous and will take a bit longer to cook. If you’re using baby bok shoy, they tend to be much smaller in size, maybe about 2-inches in length. Wash them thoroughly and then cut into quarters length-wise. You can cook everything in one skillet if you wish. Just make the cauliflower rice portion in the skillet first, remove from the heat. Add oil, and then proceed with the chicken in the same pan. I like to cut down on time and cook in two separate pans at the same time – plus my cauliflower rice and veggies stay hot just in time for dinner! If you aren’t paleo, you can substitute cornstarch for the tapioca starch. You can also substitute gluten-free tamari sauce for the coconut aminos. These bowls are great for meal prep! I like to make a double batch of the sauce if I’m making these for lunches so I can add more sauce throughout the week. It also helps to store the cauliflower rice and veggies separately from the chicken so the “rice” doesn’t soak up all the sauce. This recipe serves four, so if you want to make this for meal prep, I’d highly suggest doubling the recipe. You won’t regret it! Use whatever vegetables you have on hand. Cabbage, zucchini, snap peas, and broccoli all make great choices here. You can steam them separately or sauteé in the skillet with the cauliflower rice, carrots and bok choy. You may need to adjust your cook time for vegetables that may take longer, like broccoli. It’s no secret I love eating my lunch in bowls. It’s just so satisfying! If you’re the same way, you’ll love some of these gluten-free lunch recipes served in bowls this crock pot pineapple pork burrito bowl is an easy make ahead meal that is a meal prep favorite around on house. If you’re looking for something plant-based then try my Curried Chickpea and Sweet Potato Quinoa Power Bowl. The dressing alone is a good enough reason to try this recipe! For another paleo bowl recipe, try this Egg Roll in a Bowl recipe. It’s an easy weeknight meal that’s on the table in under 30 minutes – and it’s keto! 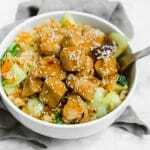 These paleo chicken teriyaki cauliflower rice bowls are so delicious and full of flavor. They’re gluten-free, dairy-free and grain-free, making this a great choice for a healthy meal prep. 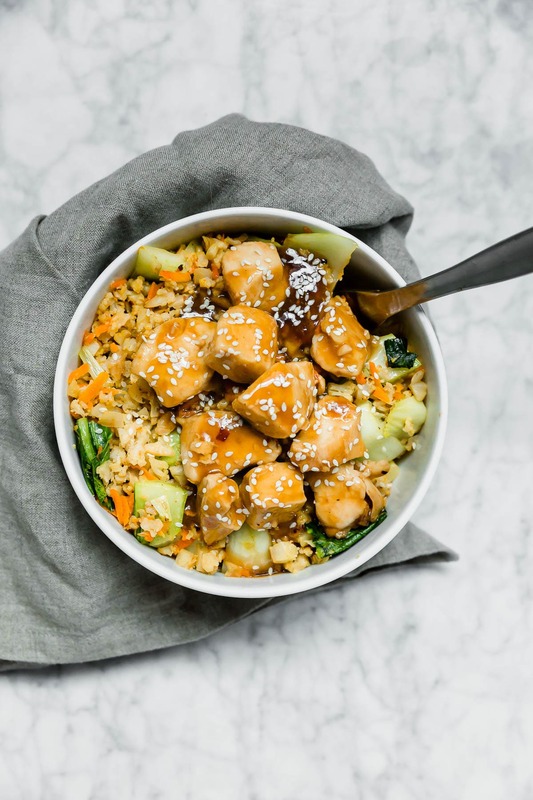 Cauliflower rice provides the base to this flavorful chicken and is packed with carrots and sauteéd bok choy for the ultimate veggie goodness. Trust me, you’ll fall in love with the sauce alone! 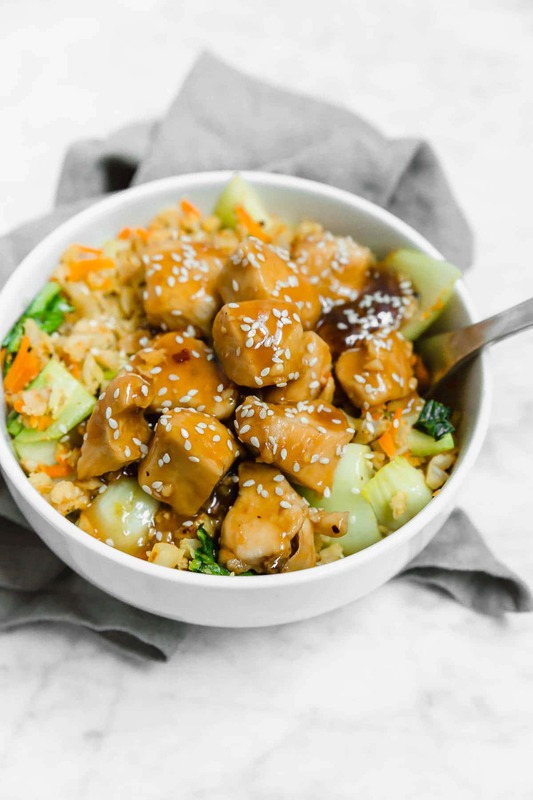 These paleo chicken teriyaki cauliflower rice bowls are full of tons of flavor, you'll love having this recipe in your pocket for a quick and easy lunch or healthy meal prep. Instead of rice, we're using cauliflower "rice" as the base of this bowl. Mixed with carrots and bok choy, this bowl is loaded with veggie power! Add cauliflower pieces to a food processor. Pulse 10-20 times, until the cauliflower is the size of rice. Preheat a medium skillet with oil over medium heat. Add the cauliflower rice. Cook for 3-4 minutes, until starting to brown. Add minced garlic and cook for 1 minutes, stirring frequently so the garlic does not burn. Add the shredded carrots and sliced bok choy to the sillet and cook an additional 4-5 minutes. Sprinkle with 1/8 teaspoon of salt and stir to combine. Remove from heat. While the cauliflower rice is cooking, start on the chicken. Preheat a large skillet with oil. Add chicken pieces seasoned with salt and pepper. Let cook for about 3-4 minutes on each side, until the chicken is lightly browned and no longer pink in the middle. While the chicken is cooking, make the teriyaki sauce. Combine coconut aminos, honey or maple syrup, 1/4 cup water, ginger, and red pepper flakes. Whisk to combine. In a small bowl, whisk together tapioca starch and two tablespoons of water until there are no more clumps from the tapioca starch. Whisk it into the teriyaki sauce. Once the chicken is done cooking, pour the teriyaki sauce over the chicken. Bring the sauce to a simmer, which should take 2-3 minutes. Make sure to stir so the sauce doesn't burn and spoon it over the chicken. Continue cooking until the sauce is thickened. Remove from heat. To assemble, add cauliflower rice to a bowl. Top with chicken and teriyaki sauce. Sprinkle with sesame seeds.